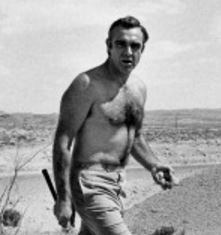 I was looking for archival photos of the Shriners Hospitals For Children Open, and ran across this one of Sean Connery playing golf in the Nevada desert. Shirtless. With no green in sight. The photo was taken on the set of Diamonds Are Forever in 1971. As James Bond, Connery more famously played a round of golf in the movie Goldfinger against the villain, Auric Goldfinger. What Is A Draw In Golf?